Hummus is that vegan staple that will show up at any party, mixer, or office potluck. Traditionally made with chickpeas, I had to look for alternatives when switching to a low carb way of eating. 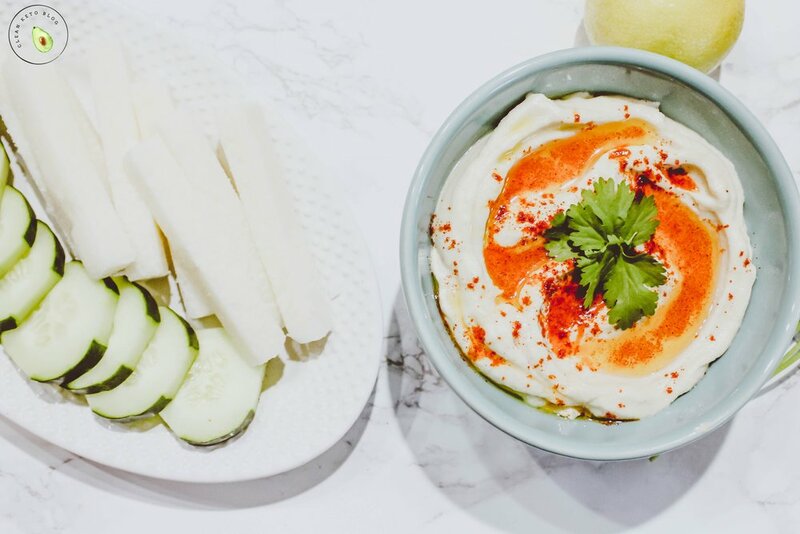 Let’s give a much deserved, teary-eyed slow clap to the low carb veggie MVP, cauliflower, who is the star of this smokey cauliflower hummus recipe. This versatile member of the cabbage family does it all – rice, pureed for a spot on mashed potato swap, or in this case a creamy, savory, smooth dip that will become a staple recipe on your keto journey. Lightly toss florets in olive oil and salt. Place cauliflower on cookie sheet lined with parchment paper. This keeps it from sticking to the pan, and makes for a quick clean up! Roast in oven for 25-30 minutes. Place cauliflower, lemon juice, Tahini, garlic, olive oil, cumin and sea salt into a blender or food processor. Blend until smooth. Transfer hummus into a bowl and drizzle olive oil over the top, then sprinkle with smoked paprika. Serve with choice of low carb veggies such as jicama, celery, cucumbers, radishes, etc. My new favorite low carb veggie is Jicama, a root vegetable with loads of prebiotic fiber comes from the legume family. It has amazing texture that gives a crisp crunch to salads, and shown here as a dipping stick for cauliflower hummus. Did you know that you can use them to make *drum roll* FRIES?! Stay tuned for more jicama recipes! Thank you! Look in your email for a confirmation to subscribe. Your first email will come Thursday afternoon with tips and ticks on your ketogenic journey!